Planning for this National Park activation for the Keith Roget Memorial National Parks Award started back in late November 2011. I posted an email to the KRMNPA Yahoo group asking if any of the group wanted to come along with me. I made the invitation intentionally blunt so there was no doubt what people were in for if they came along. From the KRMNPA group I got no takers. A couple of the members said they would like to join me but were busy elsewhere. This was all quite fine by me as we are a varied group with different levels of experience, ability and desires. 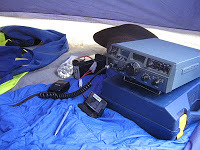 My next source of people to hike with was the Scout Radio & Electronics Service Unit. Here I got more interest with Matt, VK2ADF, Kevin, VK3KAB, and Adam VK3YDF, offering to come along. Adam came on the 2010 activation and this year had offered to paddle a kayak across, carrying additional weight of required. Matt is based in Sydney at present and was in Melbourne on holidays. On the Thursday I got news that both Adam and Kevin had to pull out of the trip. This was a little disappointing as they were both keen to come along but circumstance had forced their withdrawal. On Saturday morning I met up with Matt and Ash, VK3SSB, at the McDonald’s in Mornington. Ash had come along to drop Matt off and catch up. I hadn’t seen Ash for about 12 months although I had worked him on air earlier in the month. Matt and I then headed 20 minutes down the road to the Stony Point Caravan Park where we parked the car, loaded up our packs, bought our ferry tickets and headed out on the pier. After a 15 minute ride to the Tankerton Jetty I was back on the island again. There is something about French Island that suggests it hasn’t changed in a long time. It certainly hasn’t changed in the past two years. I think even some of the cars in the car park haven’t moved since I was last here. We headed off to the camp, stopping twice along the way. Once for the obligatory National Parks sign photo and once for a break and some water. The walk to the camp took just over an hour. On arrival at the camp we found we had the whole camping area to ourselves and we talked about where best to set up the antennas and then place the tents to suit. 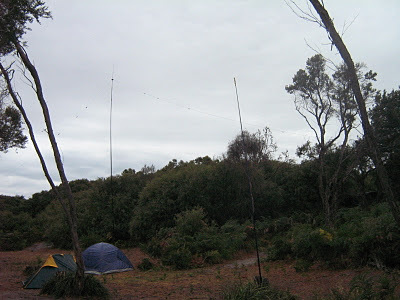 Rain had been forecast so we set the squid pole antennas up followed by the tents before getting on air. This proved to be a wise move as the rain started lightly falling part way through our first sked. 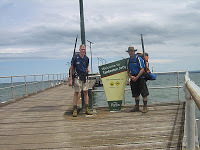 While setting the antennas we were joined by two other campers who had walked up from the jetty, carrying their gear in two shopping jeeps. Not too silly except for the sandy parts of the track. Matt had a 20 m ground plane based on a 6 metre squid pole and my multi-band switched inverted vee antenna was held up by my 10 metre squid pole. Both poles were tied off to tree stumps conveniently left by Parks Victoria. Just after getting the antennas in the air the local parks Ranger gave us a visit. He wanted to know what we were up to and why we had these big antennas set up. After chatting for about 5 minutes and explaining about the Keith Roget Memorial National Parks award and amateur radio in general he wished us well and left us alone. Prior to the weekend I had posted a schedule of times and frequencies where stations might find us and this proved to be most useful. I had planned these skeds to make the most of the propagation and to try and get contacts on the 10, 15, 20, 40 and 80 m bands. Our first sked was at 1:00 pm on 10 m. I was keen to work at least one contact using my own call sign before we worked the VK3SAT club call sign. 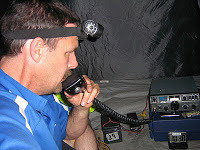 My first QSO was just before 1:00 pm with Greg, VK2GJC, from Ulladulla on the south coast of New South Wales. We then worked 7 stations on 10 m pausing only to move the rigs inside the tents out of the rain. During the next 5 hours we worked 15, 20 and 40 m bands and added another 44 QSOs to the VK3SAT log. These QSOs came on my FT7 and Matt’s IC7000. The IC7000 had suffered a small accident a week before the trip when it got knocked of the table and damaged the volume control. Matt needed to use needle nose pliers to adjusts the volume but once set it was left alone. The rain continued intermittently and Matt and I worked from our own tents. During a break in the rain Matt and I hung his adjustable dipole in the tallest tree we could access and this gave Matt access to 40 m while I was working 20 m.
At 8 pm we had a sked on 80 meters and after working only 1 station and hearing no more we decided it was perhaps a little early for 80 metres as it was about 45 minutes before sunset. So we turned the rig off and waited until dusk before trying again. When we came back on air there was quite a few stations wanting to work us and over the next hour we put 14 QSO in the log. Before turning in for the evening I lowered the multi-band inverted vee antenna as it looked like a big storm was heading our way. I got a text message from VK3JNI, about 10:30 pm, telling us that indeed there was a storm about to hit. Thanks Phil. The rain came and got heavier and the tent leaked a little. I had placed the radio back in its box and made sure it was protected against water ingress as best as I could. The same couldn’t be said for my bum bag which got wet, as did the ferry ticket inside. I was able to dry the ticket off during the morning by sitting it on top of the radio while making more QSOs. 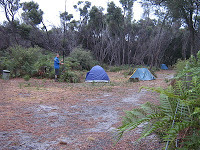 The night was very warm and humid with the temperature in the tent about 25 degrees at 1:00 am with rain falling outside. In the morning we set the antenna back up and worked the skeds again. This got us another 17 QSOs in the log with all skeds except 15 m being productive. At 10:28 am we made our last contact and just after 11:00 we were all packed up and heading back to the ferry. We made good time to Tankerton, working Graeme VK3GL, on the VK3RMC UHF repeater along the way. We stopped at the small picnic table hear the jetty for a little while waiting for the ferry time and then headed out to meet the boat. An uneventful trip across and we were back on the mainland. I must, of course, thank Matt VK2ADF for coming along and working over 30% of the QSOs. I’d also like to thank all the stations that made the effort to work VK3SAT. I’d like to make particular mention of Alex, VK4TE, who made every sked and worked us on all 5 bands and also Ian, VK3FD, who was so keen to work the National Park on 5 bands that he went mobile and got as close to us as he could on the mainland to be sure to make the higher band QSOs. 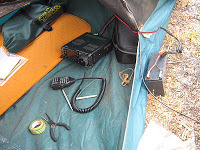 A special mention to Kevin, VK3KAB, who was unable to make the trip but still went portable on Sunday at Tooradin, setting up his Buddie Pole, to work us on 20 and 10 m.
This activation didn’t get me any new parks as I have been here before, but it did give many others, including Matt, the opportunity to claim a new park for the Keith Roget Memorial National Parks award. Depending on the interest and demand I might just head back in 2014. This entry was posted in KRMNPA. Bookmark the permalink. 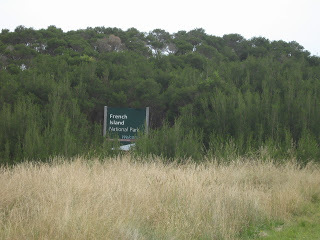 Planning to activate French Island NP in November 2016. Just a day trip. Where is the nearest NP sign from Tankerton Jetty? My ability to walk long distances is now limited, and plan to use a 2-wheel trolley to reach the nearest suitable point in the park. 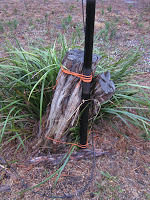 Squid-pole inverted link dipole with the KX3, small fold-up table and folding seat. John – I have sent you an email direct. Many thanks to you and Matt for the activation. Making contact on all 5 bands was a real treat, and whilst I am unlikely to be able to do that for all of the Vic National Parks, it’s something more to think about into the future. With French Island now in my list, I’m looking forward to getting my last 14 – 2011 was a great KRMNPA year for me as I started at zero. Generally my wife and I tour with the caravan in tow and pick-up National Parks (and VK3 Local Government areas -72 so far) whilst mobile. So, thanks again, and I hope to provide other award-chasers with more opportunities in coming months. Was good to work you on the Saturday evening on 40m after trying throughout the day without success. Great work promoting the hobby and getting out there and giving it a crack!